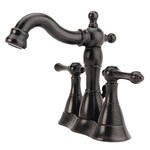 These faucets are made for basins with three holes and have handles that are 4 inches apart. They combine a spout and valves on a single base unit. 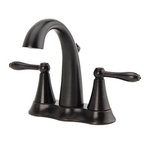 Center-set faucets may have a single handle or two handles mounted onto a plate. NOTE: Not all drains included with the faucets will work with a copper sink.